The Museum’s AVRO 504 biplane was once again travelling into Europe last week, as on behalf of the Royal Air Force and French Air Force (Armée de l’Air), the Yorkshire Air Museum was commissioned to undertake an exhibition with full sized aircraft celebrating over 100 years of close co-operation between the two air forces at Les Invalides in the centre of Paris from 24th until 28th May 2018. Joining us in Paris was a 1916 French SPAD VII fighter on loan from the Conservatoire d’Aquitaine in Bordeaux. This beautiful V8 powered fighter was decorated in the colours of French fighter ace Georges Guynemer. The Royal Air Force was formed on the battlefields of the France during WWI, 100 years ago this year and many will recall the previous visit of the AVRO to France when we were invited to display the aircraft at the Thiepval memorial on the 100th anniversary of the start of the Battle of the Somme. More than ten thousand people saw this old aircraft as they remembered the beginning of an era that marked the industrialisation of warfare. So it was very fitting that the Museum’s AVRO was chosen to be present in Paris last week at this famous location to commemorate another significant event in European history. Les Invalides is the famous 17th century hospital, courtyard and cathedral built by Louis XIV, and home to the tomb of Napoleon and some of France’s top museums. 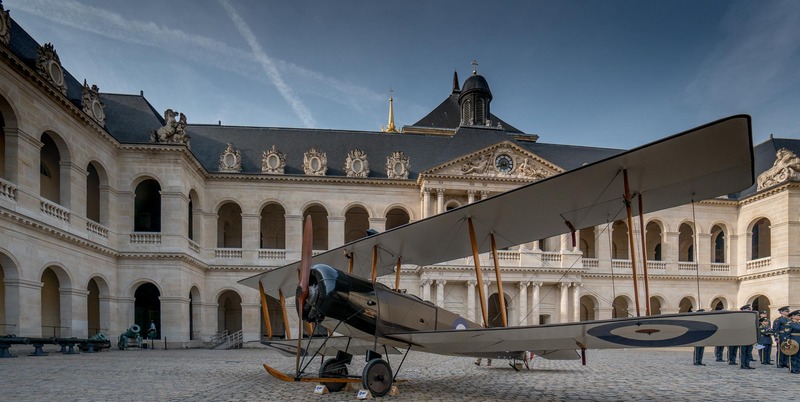 It is the first time that a UK Museum has been permitted to display inside the courtyard of Les Invalides and the first time that any aircraft have been displayed there since 1945. As regular visitors to the museum will know, our location in the grounds of the former RAF Elvington near York was the home of the only two French Heavy Bomber Squadrons of WW2 with over 2300 French airmen based here. The Museum is also the European accredited Allied Air Forces Memorial with a small team of people who reach out to memorials across Europe to remember those airmen across the years who have sacrificed so much so that we can enjoy the peace in Europe that we have today. The occasion was surrounded by tight security as many heads of NATO and other air forces with Paris representatives joined us to commemorate this unique occasion. Head of the Royal Air Force, Air Chief Marshall Sir Stephen Hillier KCB CBE DFC ADC MA RAF was joined by Général André Lanata, Chief of the Armée de L’Air who is also Vice President of the Museum together with Lord Llewelyn. UK Ambassador and General Bruno Le Ray, Military Governor of Paris. The two aircraft were positioned inside the majestic courtyard of Les Invalides alongside the bands of the Royal Air Force and French Air Force and as the VIP guests arrived, the ceremony was broadcast live by media across the UK and Europe. Across the following weekend, the two aircraft remained on display inside the historic courtyard as public visitors enjoyed the unique sight of these two aircraft on display in the centre of Paris. Looked over by the statue of Napoleon inside the courtyard of possibly the world’s first military hospital, it seemed very fitting that everyone was reminded of the history of Britain and France, both as military adversaries centuries ago and now today, as friends and collaborators in the air. je suis membre du Conservatoire Air et Espace d’Aquitaine. Merci pour ces superbes videos et photos.